1. Field a league with 8 teams of players. We only had 5 in the Spring, but we had 11 in the Summer. We averaged 8 teams per season, so we’ll call that a SUCCESS. 2. Donate 40% of our revenues. We definitely underestimated the cost of certain items in our budget, but they ended up being necessary to build a foundation for future seasons. Still, I think hindsight has shown that was way too optimistic. After going through Year 1, I’d now say 22.75% is pretty solid, but we FAILED on this one. 3. Donate more than $3,000. We *only* donated $2,800 in cash and didn’t quite hit $3,000, but our physical item donation drives were much more successful than I anticipated. With an estimated value of an additional $2,500 worth of items donated, I think we should call this a SUCCESS. 4. 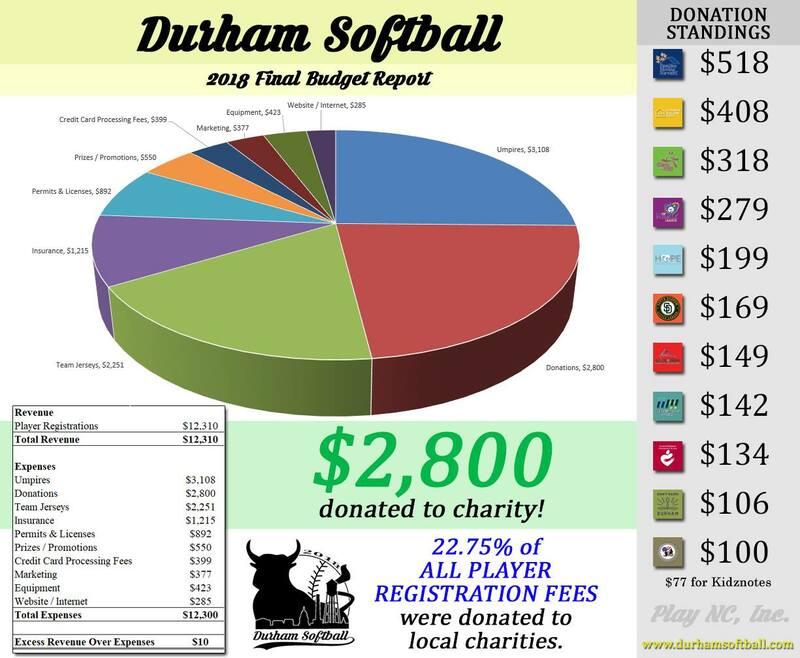 Get the Durham Bulls Baseball Club to acknowledge our league’s existence. We were really just hoping for a Twitter shout out or something, but we won their $10,000 Ballpark Renovation Grant and got invited onto the DBAP field to represent our league at a Bulls game. That was incredible. I still can’t believe it happened, but there are photos so I’m pretty sure it was real. Huge SUCCESS here. 5. Reach 500 Facebook Followers. We didn’t make it to 500, but the Followers we do have are great. If you’ve read this far and you’re still reading because you care about this league, you’re extra awesome. We FAILED, but maybe we’ll get there before next season! Going 3 for 5 sounds like a pretty good game, so we’ll take it! Thanks again for playing everyone!